Raymond Celaya was first in a stretching line outside the Brian Garcia Welcome Center as the doors swung open at 7:30 a.m. sharp on a recent Wednesday morning. Celaya, 53, walked inside as the summer heat began setting in, his few possessions slung over his shoulder in a zip-up cloth Costco bag. But missing among his belongings was perhaps the most important thing someone trying to escape life on the streets needs: identification. Weeks earlier, Celaya’s wallet was snatched while he slept at a light rail stop in downtown Phoenix. His documents, social security card, state ID, food stamp card: All gone. With them went his ticket to employment and any housing more permanent than the homeless shelters he frequents. That’s how he ended up that Wednesday morning at the Human Service Campus and offices of the Homeless ID Project. The project, one of its kind, helps individuals struggling with homelessness track down and pay for forms of identification. For some, it’s a stolen Arizona ID. For others, it’s a long-gone birth certificate from a distant state. For many, it’s all of the above. Once the process starts, project manager Eric Ortega said, the project can store people’s documents so they don’t get taken or lost at shelters or on the street. The initiative started 30 years ago when a Phoenix clergyman, the Rev. Gerald Roseberry, spent a month living on the streets of downtown Phoenix and Tucson to learn more about the problems facing homeless communities and how his clergy could best address them. Lack of identification was one of the largest barriers he found, and one that was often overlooked. “I discovered that those who wanted to work needed identification and I began to ask around to see what I could do,” Roseberry said. He and the other volunteers who now make up the project found the ID problem can create a vicious circle. About 36,000 people in Arizona struggle with homelessness, or one in every 184 Arizonans, the Phoenix Rescue Mission reports. More than a third of those are families. That number is growing. In 2017, the Maricopa County Board of Governors reported that the rate of homelessness in Maricopa County has increased nearly 60 percent in two years. 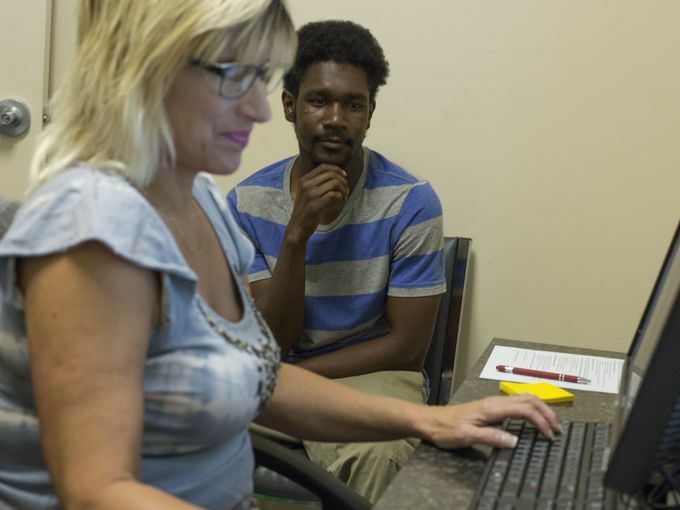 In 2017, the small group of volunteers at the Homeless ID Project staffing four computers helped 8,200 people obtain identification. On any given day, they help about 40 people. Wednesday morning, people filled the chairs along the wall outside the small set of offices from which the project operates. A young woman with a backpack sat in line, cradling a Spanish textbook from the Phoenix Public Library in her arms. A family chatted together a few seats down and men and women of varying ages waited around them. Some left their possessions sitting at their feet; others had only what fit in their pockets. Roseberry formed the Homeless ID Project in 1988 as the Ecumenical Chaplaincy for the Homeless. He said there are more assets than ever to help address the homeless crisis in downtown Phoenix. Roseberry, with little knowledge of the documentation process for birth certificates, Social Security cards and state IDs, got to work at the Society of St. Vincent de Paul homeless shelter. He began the registration process, doing small things like driving people to the Social Security Office to get their cards. Today, the group continues to do the job, collaborating with a cluster of other organizations off of Madison and 12th avenues. In April, Homeless ID Project worked to expand the initiative, working with state Rep. Reginald Bolding, D-Phoenix, to propose House Bill 2575. The bill, signed into law by Gov. Doug Ducey on the last day of legislative session, waives identification licensing fees for homeless veterans in the state. The effort could make all the difference for people like Celaya, who’s been living on the streets for years, and to 23-year-old Maceo Jackson, who walked out of the center clutching a voucher for a new ID.